The outlook for base metals is not particularly encouraging, given the continuing strengthening of the dollar and slowing economic growth in China. Advisory services firm Moody’s stated in September 2015 that a perceived sharper-than-expected slowing of the Chinese economy, limited supply response from commodity producers, overcapacity in global steel markets, reduced energy costs and a strong US dollar were creating unprecedented adverse conditions for base metals, driving prices down to levels close to those achieved in the 2008/9 financial crisis, but with drawn-out recovery prospects. Moody’s states that there is little impetus to materially reverse the recent slide in base metals prices, which it expects to remain in the lower ranges for a relatively long timeframe. 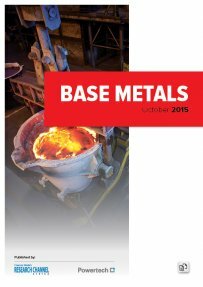 In light of these developments, Creamer Media’s 'Base Metals 2015 Report' examines the global base metals market, with a particular focus on supply and demand; the production of copper, zinc, nickel and lead in the African market, and on selected base metals operations and projects in Africa. This report is a summary of information published in Engineering News and Mining Weekly, as well as of information available in the public domain and does not purport to provide an analysis of market trends. Published on: 16 October 2015.